From Jakarta, take the toll road (motorway) that runs west to Merak. Exit south at the Pandeglang turn-off and drive to Pandeglang. In Pandeglang, you will arrive at a traffic circle with a nice (small) tower (decoration) in its center. You shall go right here, however, this street is one-way (only at its very end) and you may have to make a little loop in order to join the proper road a block uphill near location S06.30832, E106.10544. Follow this road directly uphill until the road forks near location S06.29871, E106.0922, where you take the right branch. You are now on the road that is key to proper route finding. Drive onwards on this narrow road, always go straight ahead and follow what looks like the main road whenever there are minor intersections. 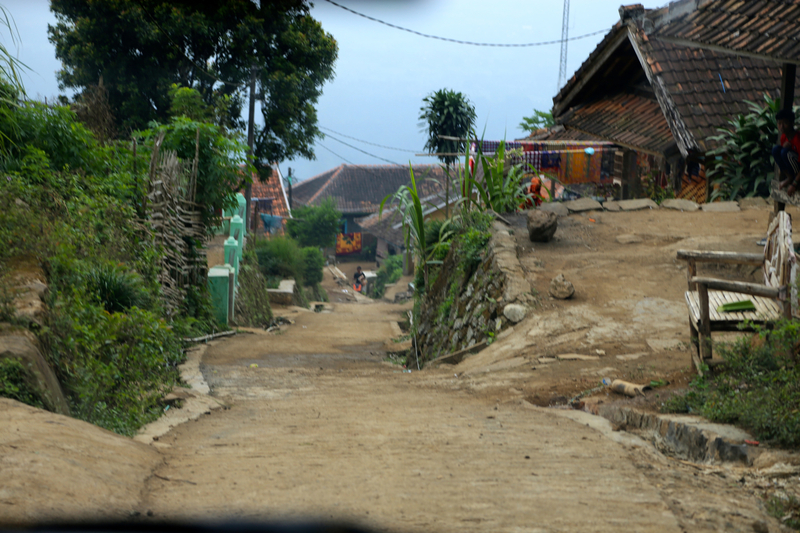 This road continues to climb as well as passing through small clusters of houses. When you arrive at a fork having a big green (some sort of information?) sign one your left hand side, then take the right branch, this is also the road that looks best to drive. After a bit more of driving you arrive into a surprisingly large village. This is Kadoengang, or also sometimes called Kadu Engan. Contine straight ahead until you arrivwe at a T-junction, where one should turn left and uphill. 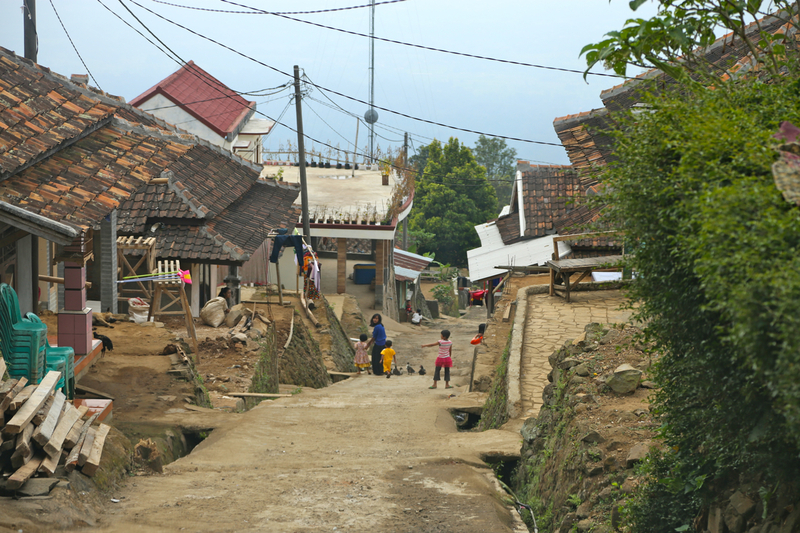 This village street is quite steep as it heads directly uphill between buildings. You will pass a communication mast (for mobile phones) on your left near the top of the village. Continue straight until the road turns into a trail. There is parking (for 1-2 cars) on your right hand side. This is the trailhead, location S06.26167, E106.07183, elevation about 850 meter. 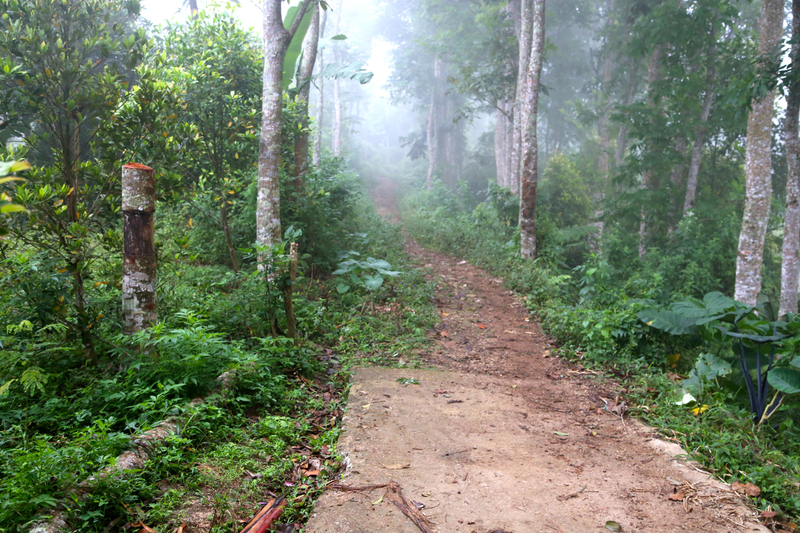 There is only one obvious trail going gently uphill as a natural continuation of the road. This trail gradually turns right as it continues to climb. There are a few side-trails, always go straight ahead and/or pick the largest trail heading uphill. As you climb higher, the trail climbs a small spur and then enters a hillside where there is farming activity. 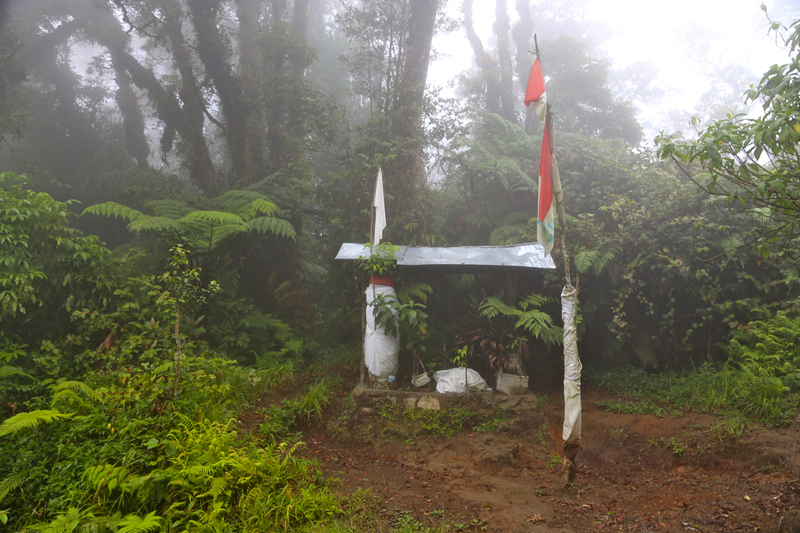 There are several small huts, the trail runs close by while sustaining a good climb. The entire trail is for the most part clay or soil that gets very slippery when wet. 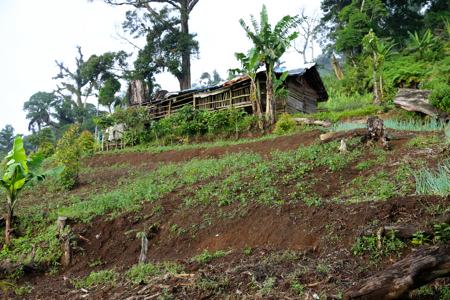 The farm area extends up to around 1400 meter. Higher up. the trail leaves this (open) hillside and enters a forest where it quickly starts climbing a ridge that extends higher to the climbers right hand side (when looking uphill). This ridge is quite nice and pretty narrow in a few places (never less than the width of a comfortable trail). It first leads to a false summit, a fairly steep and slippery descent to a wide connecting saddle, then a more gradual ascent to the proper summit. 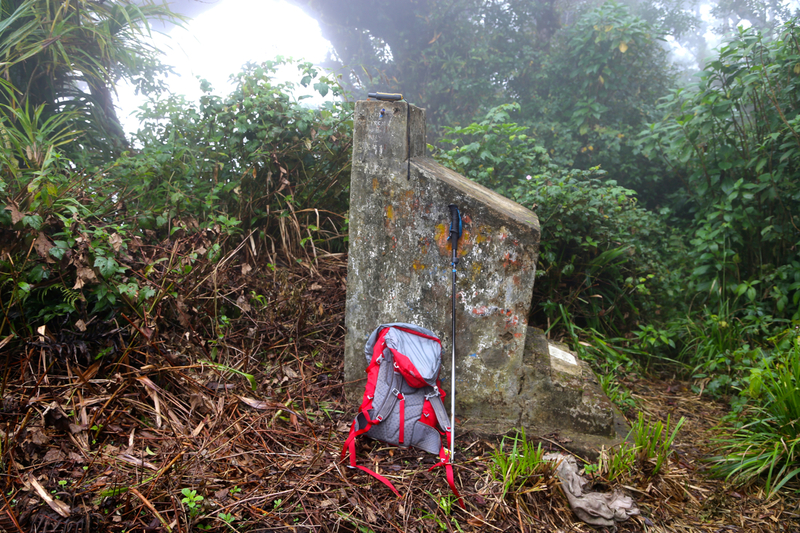 There are a few summit symbols, a small house, some decoration with a pole and a flag. The highest point is located about 10 meter onwards to the left. It is marked by a pretty large concrete slab. The plan was to climb Pangrango, however, it turned out that the park officials had closed the park for access the entire month of July. 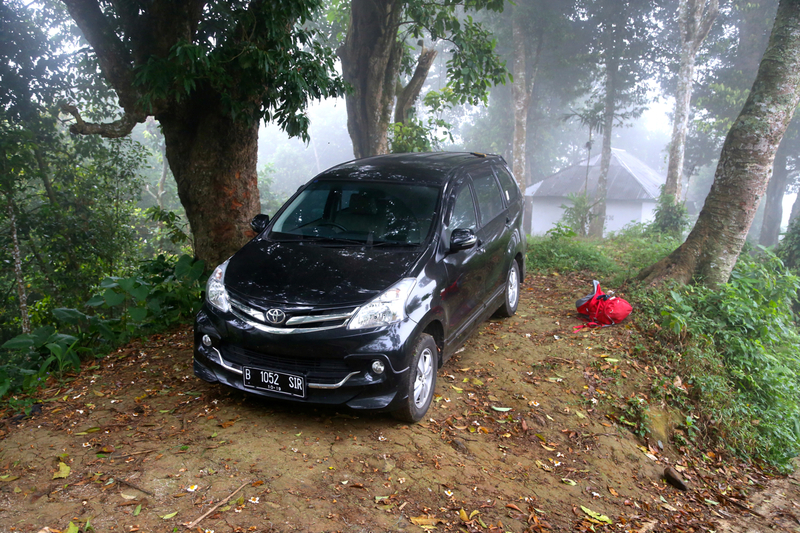 A plan B was needed and after looking at the driving involved, I decided to try Gunung Karang. I left my hotel in Bogor already at 0300, traffic is bad due to the end of Ramadan later this week. 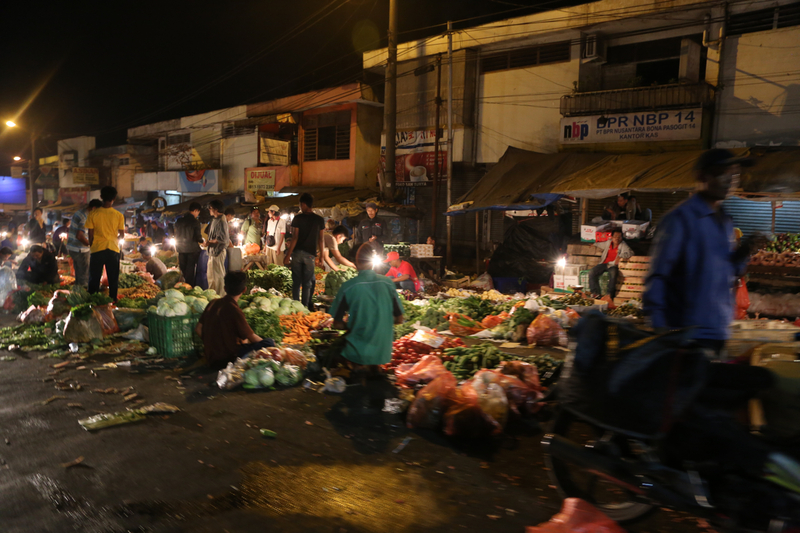 It looked like a market in full operation as we drove through Bogor, lots of people and traffic in the streets at 0315! Thanks to good preparation and my GPS, the driver got me to the very beginning of the trail. 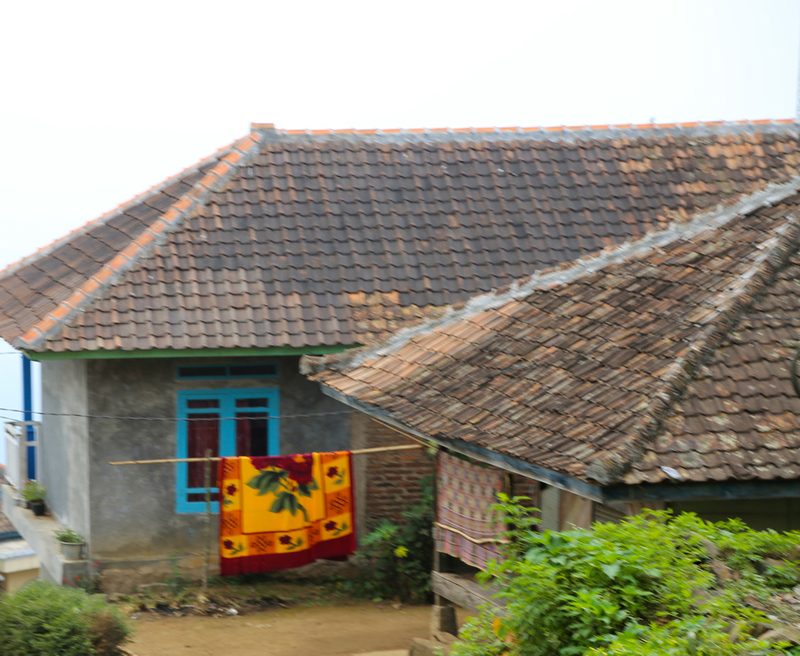 This last village, Kadoengang, was surprisingly large given the long, narrow access road. The main street is a rather steep street running directly up the hill. I started hiking at 0625, the trail was pretty obvious, but slippery from recent rain. Interesting to see the farm areas higher up on the slope. 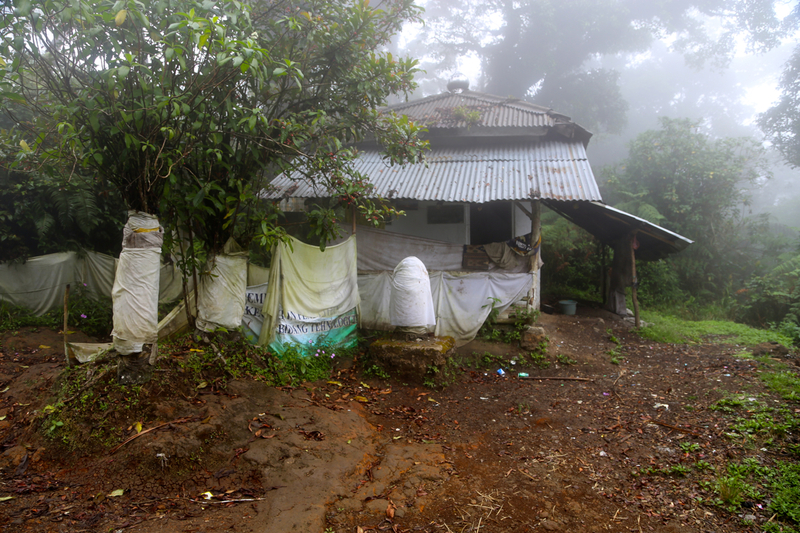 The huts that were scattered around looked like day-use quarters. Higher up, the trail got somewhat easier, that is better friction, as it entered an area of forest. Gradually, the route entered a more well defined ridge that gently climbed higher. I soon arrived at the "false summit" (really just a small flat area among the trees), but this was still the only downhill section of the trail. The last part was easy and I emerged onto a flat area with some sort of shelter. Slightly higher, to the left side, was the highest point, marked with a concrete pillar. It had taken me 1:50 to get here. 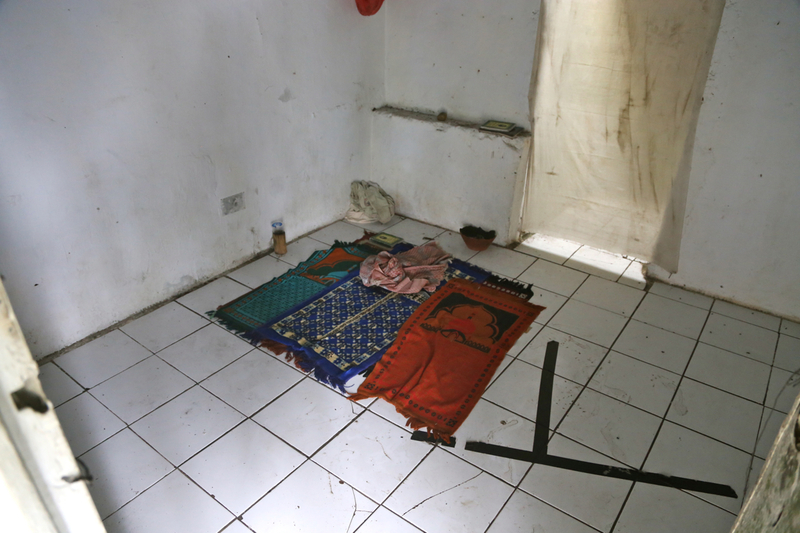 The shelter had a room with carpets meant for prayers, there were clouds all around and no views. I rested and explored the summit area until 0830 (15 min), then descended back to the car in 1:30. The drive back was uneventful and I was back at the hotel in Bogor, a bit after 1300.